Part I: Profile: How to View and Edit? There are a number of ways to view and edit your profile. 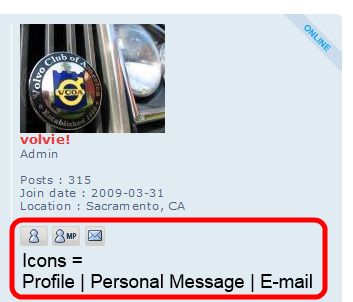 -Click the "Members" button in the toolbar. -Search for your username in the username search box or in the list and click on it. -Click the "Profile" button in the toolbar. -The "Information" tab will open first. Information, Preferences, Signature, Avatar, Notifications. -E-mail and password can be changed here. -Personalized Profile fields are optional. -Consider filling out the location field before posting an ad in the Classified / Marketplace section so people know where you are. Options to consider setting to "yes"
Check that your e-mail address is correct in the Information tab before turning on this setting. Contact will be via forum e-mail form (see screenshot below in part III). 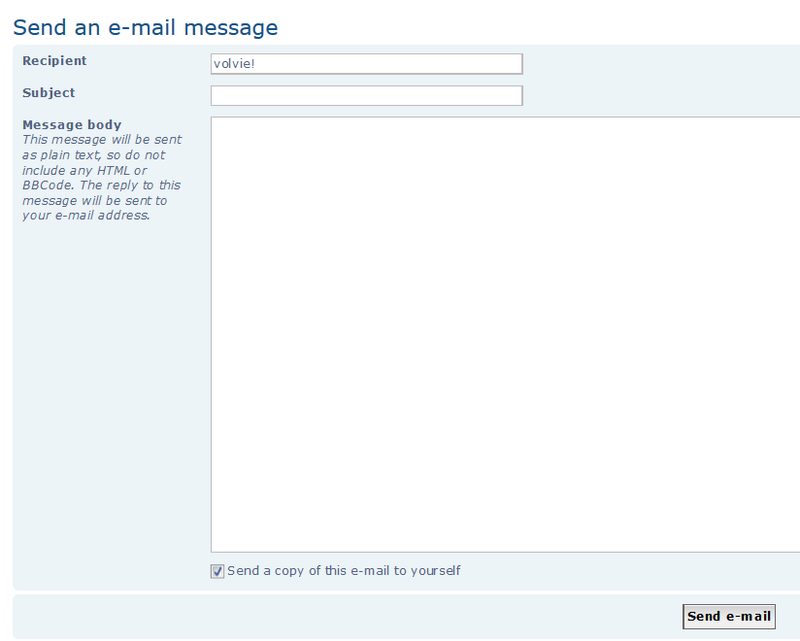 Contact will be via forum pm form (see screenshot below in part III). Notifications can be set to receive e-mails when a member contacts you via personal message (see the Notifications Tab). In the event that that we need to contact all forum members about forum-specific news or issues. Note that this is forum newsletter is different than the Sac Volvo Club Mailing List. Can set and/or change here as preferred. Forumotion is a company based in France, so the default may not be accurate to where you are. This can be changed here as preferred. You can select which notifications to receive via e-mail. 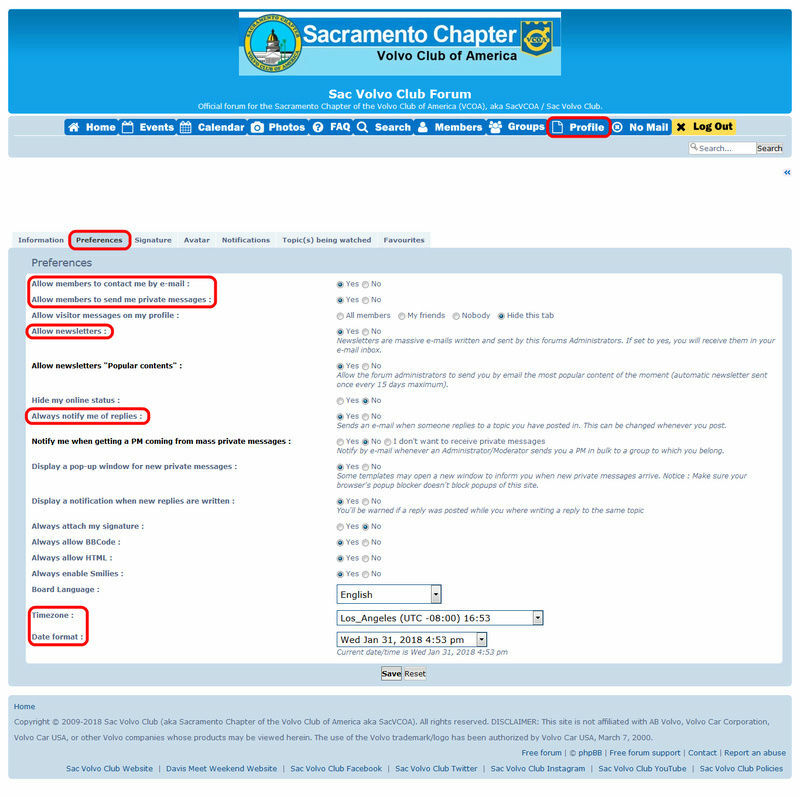 Part III: Forum Communications: How to Contact a Member via Forum PM or E-mail? The easiest way to contact a member regarding their classified ad is to view their ad (make sure you are logged in) and select one of the contact buttons under their username.